The Ford GT is an awesome car. It truly is a marvel how it can be at home on the track and on the street. Unfortunately the street can be a harsh environment for a performance car. Especially one that sits so low. GT owners have found that getting in and out of parking lots and up and down some hills (Seattle especially) can cause the rear diffuser to scrape and drag on the ground causing damage. 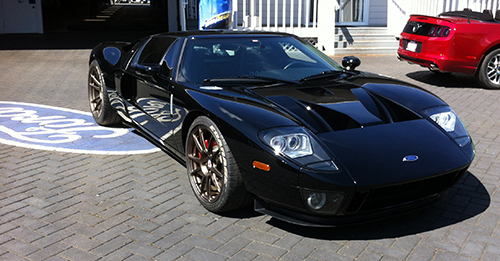 STILLEN has been involved from the beginning of this car in the form of racing and performance upgrades. STILLEN has designed a couple of different diffusers that will handle the abuse that the street can dish out. 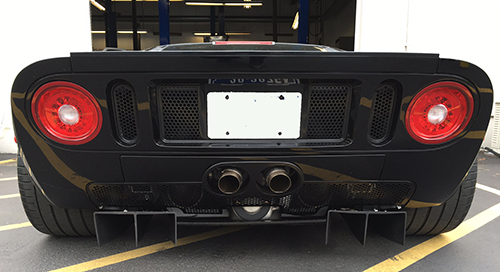 They have made a diffuser that is made from a durable urethane and provides optimum downforce as well. They have also made one that is the same size as the original as well. It is easy to install too. You can read about it on their website here. Here are a couple of pictures to show how it is installed. First we rack up the car and take off the rear lower pan and drill out the rivets holding on the original diffuser. Here are the diffusers from STILLEN. They have small indents for markings on where to drill the holes and it also is formed with a slight indent so it slides into place perfectly. 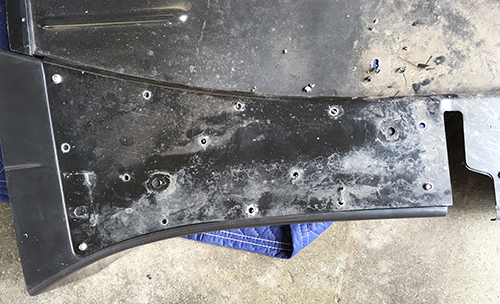 Then we rivet the new pieces on and re-install the rear lower pan.